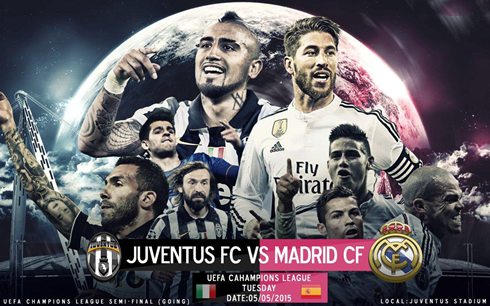 The UEFA Champions League semi-finals have finally arrived and in order for Real Madrid to keep pursuing their dream of winning "La Undécima", they'll have go through the Turin giants of Juventus. Cristiano Ronaldo and Bale will spearhead the attack for the Merengues, but will it be enough to break one of the most consistent defense in the world of football? Of course, as has been the case most season, Real Madrid will be without their linchpin Luka Modric. They've coped fairly well in recent weeks without him, but against a Juventus midfield packed with talent and formed by the likes of Arturo Vidal, Claudio Marchisio and the imperial Andrea Pirlo, it's clear that the Croat's influence will be sorely missed. Up top, Juventus boast a familiar face in the form of Alvaro Morata. The former Castilla man was transferred to Juve last summer, but Madrid still have the option to repurchase him this summer or the next. He's matured in Italy and though his goal ratio (11 in 40) isn't the most spectacular by any means, he's been an important cog for the Bianconeri. Morata's partner though, is the one who will surely cause Real Madrid the most problems. Carlos Tevez has been in impeccable form all season long. He's netted 20 goals in the Serie A and a further 6 in Europe. Tevez has suffered from discipline issues in the past, mostly in his time at Manchester City, but the 2015 version Tevez is focused, engaged and enjoying life in Turin. He will surely give the likes of Pepe and Varane some trouble, but thankfully, the pace of Varane could be a negating factor against the Argentine striker. All reports indicate that Carlo Ancelotti will opt for a 4-4-2 vs the Italian giants. This is good news, he's used Ramos in midfield a lot recently and it appears to work well, giving Toni Kroos some much needed help on the defensive side of the ball. With Pepe and Varane at the back and Ramos having the option to fill in as a third center back when needed, Madrid should be fairly secure down the center. Where the problem may lie is on the wings. Both Dani Carvajal and Marcelo have had excellent seasons, but in the past few weeks their defensive frailties have begun to rear their heads again. Last weekend against Sevilla, Marcelo was caught out time and time again. If Fábio Coentrão doesn't end up taking his starting spot this Tuesday night, the Brazilian will have to be much more disciplined against a top quality opponent like Juventus. But perhaps the most interesting facet of Carlo Ancelotti's strategy lies in the strikers up top. Currently, it appears that Gareth Bale and Cristiano Ronaldo will occupy the space up top, especially after the confirmation that Karim Benzema won't be available for this first leg. It's an interesting experiment and it should give Bale the kind of freedom he needs to truly terrorize defenses like he did for Tottenham in the Barclays Premier League. Real Madrid are the favorites and I'm sure many Madridistas are happy to have avoided Bayern Munich and Barcelona. But make no mistake, this will not be an easy tie and despite Juventus' relative shortcomings in Europe in recent years, the Merengues will be up for a major challenge. Cristiano Ronaldo next game will be for the UEFA Champions League against Juventus, on May 5 of 2015. You can watch Juventus live stream, Juve vs Real Madrid, Barça vs Bayern Munchen, Napoli vs Dnipro, Sevilla vs Fiorentina, and Hamburg vs Freiburg, all matches provided from our football streaming live game pages.